Physical characteristics: Also known as migrant shrikes and butcherbirds, loggerhead shrikes grow to about 8.2 inches (21 centimeters) long and 1.7 ounces (48 grams) in weight—about as large as a robin. This striking bird is relatively large within the Laniidae family, and has a large head as well, which may be the source of its unusual name. Males and females look similar, with gray, white, and black markings and a black mask that extends to just over the eyes. Their upperparts are gray with white bands at the shoulders, while the bottom half of the wing is black. Undersides are white and sometimes have a barred texture. The loggerhead's appearance varies subtly by region throughout its range. Geographic range: The only shrike native to North America, the loggerhead also occupies large areas of Mexico, Alaska, and Canada, although its Canadian and Alaskan ranges shrink considerably during winter. Habitat: Loggerhead shrikes live in many types of semi-open habitats that are dominated by short vegetation. Those native to Illinois, New York, and Maryland frequent pastures, while those endemic to western states prefer sagebrush, desert scrub, and pinyon-juniper woodlands with small shrubby trees. Residential areas with suitable perches often have a number of loggerhead shrikes occupying them, and the birds have been recorded in mountainous areas up to 6,600 feet (2,000 meters) as well. Diet: Loggerheads eat mainly arthropods, invertebrates (animals without backbones) that have segmented bodies, but seem to prefer beetles and grasshoppers. They feed on small vertebrates, animals with backbones, such as mice, moles, lizards, small birds and snakes, bats, and fish, especially in winter. Behavior and reproduction: Loggerhead shrikes kill their vertebrate prey by quickly breaking their necks and using their sharp, heavy bills, which have a special cutting tooth on the upper part, to sever the spinal cord. The birds carry prey up weighing as much as their own body weight to a fence or thorny bush where they can impale their meal. This technique also allows them to anchor their prey as they dismember and eat them, since their claws are not strong enough for this purpose. The loggerhead's flight pattern is distinctive, characterized by wing fluttering followed by a glide. When hunting, the birds swoop down from their perch, hover briefly over an area of open ground, and then flap up to another perch. This species mates in the spring, during which they are most vocal. They do not have a song, but rather a series of sounds more like shrieks or a metallic tapping. Loggerheads are sexually mature at one year, and are usually monogamous, although sometimes a female will mate with a second male and have a second brood during breeding season. 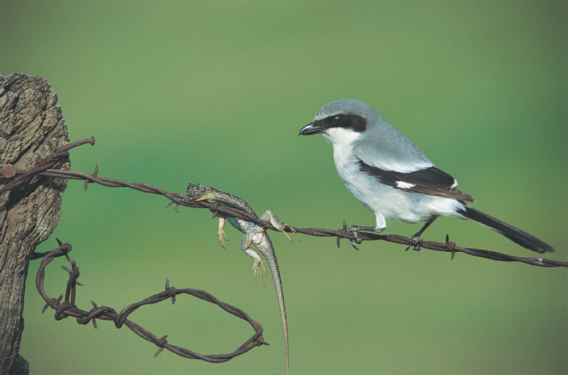 Loggerheads sometimes even mate with other species of shrikes. They prefer to mate and raise their young in grassy pastures, shrubs or small trees, on utility wires, or high up in dead trees. Both sexes gather the nest materials, but the female alone makes the structure. 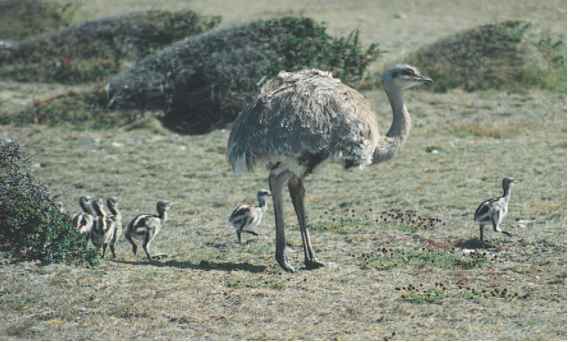 The female lays a clutch of five to seven eggs and then begins to incubate them for about sixteen days. The male feeds her during this period. Both parents feed the nestlings, which remain under their care constantly for seventeen to twenty days. The young stay near the nest after fledging, growing the feathers needed for flight, returning at night to be warmed by the female parent, and they receive food from both parents for up to three weeks after leaving the nest. Soon after, the family group breaks up and the individuals begin migration. Loggerhead shrikes and people: Humans are increasingly appreciative of the loggerhead's ability to control local populations of pest insects and mammals. These birds are also of major interest to conservationists, because their numbers are decreasing for no apparent reason. However, habitat fragmentation and destruction are thought to be major causes. Harris, T. Shrikes and Bush-shrikes. Princeton, NJ and Oxford, U.K.: Princeton University Press, 2000. Lefranc, N. Shrikes: A Guide to the Shrikes of the World. New Haven, CT and London: Yale University Press, 1997. Van Nieuwenhuyse, D. "Global Shrike Conservation: Problems, Methods, and Opportunities." Aves 36 (1999): 193-204. "Birds: Loggerhead Shrike." Hinterland Who's Who. http://www.hww.ca/ hww2.asp?pid=1&id=52&cid=7 (accessed on July 2, 2004). "Helmet-Shrikes Prionopinae." Bird Families of the World http://www. montereybay.com/creagrus/helmet-shrikes.html (accessed on July 2, 2004).